A feral cat colony is a group of cats that have never had any loving contact with human beings. The adult cats fear us and will fight to their death to escape us. To them, we are as dangerous as a coyote. By the time a feral kitten has reached the age of 5 weeks, its mother has taught it to fear us. We generally find that the younger the kitten is when captured, the easier it will be to rehabilitate it so we can adopt it into a good home. Simply feeding a colony of feral cats is not a solution. It is tantamount to cruelty if the feeder does not follow up with the Trap/Neuter/Release (TNR) method of control. Statistics show that using the TNR method on the breeding adults will cause the colony’s population to decrease to a very few adults within the year and close to zero in three years by natural attrition. 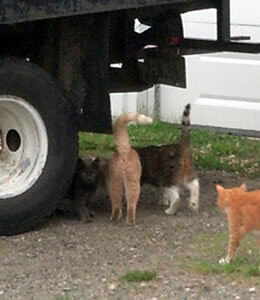 These few remaining cats will keep a new colony of feral cats from moving into the area. A responsible volunteer feeder is provided by the shelter to keep watch on the smaller colony. The very young feral kittens can generally be rehabilitated within a few days to a few months depending on the age when they were captured. This is called maintaining and controlling a feral colony. If one simply kills the cat colony as some people recommend, a new colony will immediately move in with a new “alpha male.” Therefore, killing the feral cats is not a solution and most definitely is not a humane solution. A feeder who does not practice TNR is cruel, stubborn and irresponsible. He/she is guilty of raising litters of kittens as easy prey for local fox and coyote populations as well as human abuse. Poppy and Harold with Kitty and onlooker. At Halfway Home Pet Rescue, we put aside $1,000 of our general funding to work with feral colonies. This doesn’t sound like much, but occasionally we have also received special donations or a small grant to enhance the work we have been doing for several years now. We go into a feral colony to catch as many kittens as we can find. We then trap the adults and take them to our vet for leukemia/AIDS testing, sterilization, vaccinations, treat for worms, ear mites, fleas, and clean out any wounds from fighting. The adult cats recover for a few days with a local homeowner who is experienced in caring for feral cats. The longer the adult feral cat is caged, the nastier he will become. He/she should be caged only long enough to recover from the actual surgery. These cats do not know they are being pampered by HHPR. They only know that we are their jailor and at any opportunity, they will jump past our shoulders and brave the winter wind until they freeze or starve to death. We have to be especially careful when we clean their units to not let this happen. Normally, feral cat colonies are returned to their original location to avoid another colony moving in. However, sometimes this is not possible. The location may not be suitable – no adequate shelter, no regular feeders, etc. So in these situations, after a few days of recovery, the adult feral cats from the same colony are ready to relocate to an area farmer’s barn. We are happy to see them go, spayed and neutered, into a new life in professional rodent patrol. We are seeing a fine gradual progress in this feral cat program. 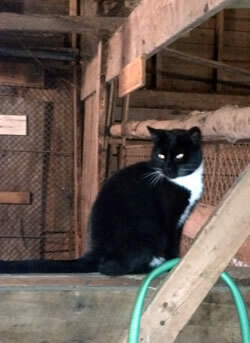 These hard-working barn cats are free to the farmer who must promise to provide them with one feeding and fresh water daily. The cats, in turn, soon start providing the farmer with proof of his rodent control by piling dead mice/rats in the doorway of the barn. The shelter, in turn, provides a supply of dry cat food to farmers who provide a home to a larger than normal number of feral cats. It is always heartwarming to drop by a farmer’s barn and see how our rodent patrollers are doing. Some of the cats have developed a semi-trusting relationship with their farmer and will allow them to approach more closely at feeding time. But they keep their own identity and maintain their aloofness within a radius of several feet. Their trust is made of fresh food and water. Feeding time is their payday. These cats are intently fearful of what humans can and have done to them in the past. Given a chance, they can have a happy, healthy lifestyle hunting through the haystacks while providing a necessary function for the farmer and enabling the farmer to stop using poisonous rodent control which can harm the environment. Help by providing a piece of safety equipment for our volunteers through ACES wish list program. Donate a recovery cage set from TruCatch. Help us by providing small to large tote boxes for making feral cat shelters. Provide Gorilla Tape and other materials for our feral cat units (available at Wal-mart, Lowe’s & S.W. Collins). If you are a farmer with cattle or horses – provide a home for 2 or 3 spayed/neutered feral cats (HHPR provides over $150 of medical care) who will keep your feed bins free of mice and rats without having to use dangerous chemicals. We provide the cat(s) free with your promise to shelter and feed/water the cat(s) 1 time per day. See some of our barn workers.